Is it my imagination, or do squirrels seem downright suicidal this time of year? It’s always a challenge dodging them in a car as they dart halfway across the road, pause, change directions and then change directions again. It’s even harder to avoid them while riding a bicycle, and the stakes are higher. For the cyclist, not the squirrels. But lately it’s gotten to the point they’re a menace even to pedestrians. I almost tripped over one last week while I was running. And believe you me, at the pace I run a squirrel should have plenty of time to get out of the way. Perhaps all the craziness is because there are just so darn many of them. Squirrels are unlikely ever to make it onto the endangered species list. There are two hundred squirrel species and they inhabit every continent but Australia and Antarctica. And they’re extremely adaptable and prolific. Contrary to what many folks think, squirrels don’t eat just nuts and pilfered birdseed. They also dine on tree buds, berries, mushrooms, insects, tree bark (and houses with wood siding), eggs, baby birds and flower bulbs. Not to mention the insulation on electric wiring, a subject I’ve ranted about in a previous column. On average, a one-and-a-half pound squirrel consumes its weight in food in just one week. What can’t immediately be eaten is “squirreled away” in holes in the ground. Squirrels rely on their keen sense of smell to find their stash when their stomachs start growling. Eastern gray squirrels breed in June and December. After a six-week gestation period, females give birth to a litter of as many as eight offspring. Squirrel “kits” are born blind and are totally dependent on their mother for two or three months. Once they leave home, they soon start making babies of their own. Which is why, no matter how many squirrels get flattened on the road, there will be plenty more to take their place. Now that the trees are almost bare, it’s easy to spot squirrel nests. 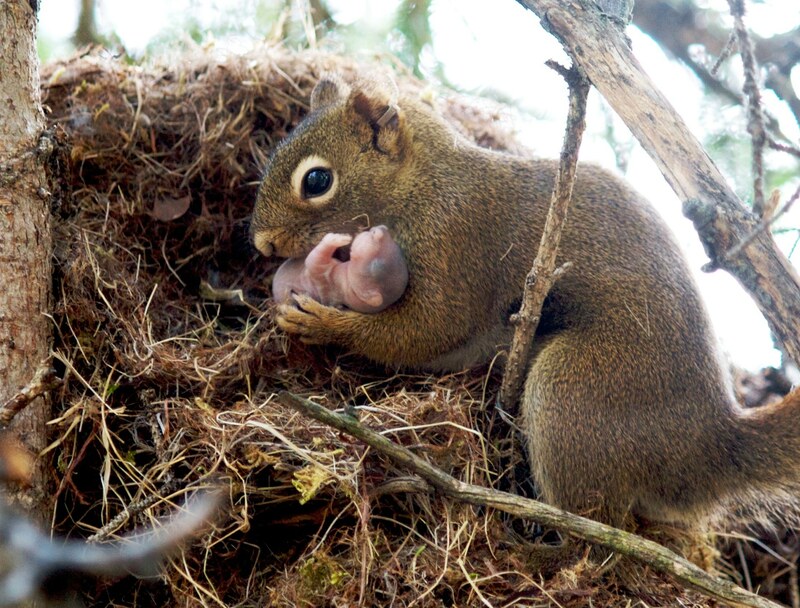 Both male and female squirrels build nests of twigs and leaves, which are usually inhabited by a single squirrel or by a mother with her young. Squirrels can build a nest in a single day and will quickly abandon it if it’s disturbed by predators or infested with mites or fleas. During the cold months, squirrels prefer to sleep in tree cavities. During autumn, squirrels may travel 50 miles or more in search of a better habitat. Yet another explanation for all their frenetic behavior this time of year. I suppose if I were entering mating season, storing up food for the winter and looking for new digs—all at the same time—I might be more than a little hyperactive, too. But you can bet I’d stay out of the way of speeding cars and bicycles. And slow joggers.